In The Physicians of Myddfai, the herb 'gellhesg y nant' is recommended for toothache but there is also a warning that swallowing it could result in 'days of delirium' or it could 'take your life'. 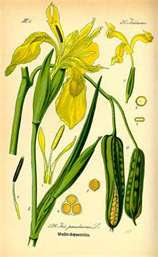 In Pughe's translation the name of the herb is given as 'water flower de lys', though it is certainly the yellow flag iris that grows in wet ground. However, none of the other herbalists - early or modern - suggest that the plant is poisonous, though it is used herbally as an emetic. Was this, then, a flight of fancy from Iolo Morganwg who is known to have supplemented the medieval manuscript of the recipes of the Physicians with his own additions?